I love Mrs. Tim! Actually, I love all of D.E. Stevenson's writing, but Mrs. Tim is my favorite. I'm glad to find another reader who likes these books! Yes, I like Hester & her adventures. I've enjoyed all the DES novels I've read so far & I have a lot more to read. I've been reading and rereading these books since the late '60s and am so delighted that so many are being reprinted these days and finding a new generation of readers. DES books are real treasures. I've only been reading DES for a few years but it's good to see some of her books back in print. To me, the wonderful thing about this type of book is the domestic detail of the times, "middle-brow" suits me so well. :) Thanks Lyn, Open Library here I come. Yes, I love the domesticity too. Especially in winter, it makes it all seem cosier. 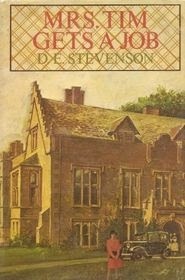 Love D E Stevenson and have read all of her books...twice! The Mrs. Tim books are among my favorites. I still have quite a few to go but I'm looking forward to reading more. I've just started the last Mrs Tim book. If only, if only someone would reprint these Mrs Tim books! Having only the first one is not enough. I want Mrs Tim Carries On, Mrs Tim Gets a Job, and Mrs Tim Flies Home readily accessible - now! 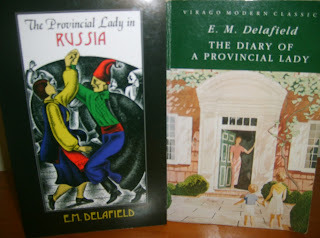 As much fun as I've had reading DES's other books, none of them have delighted me half so much as this series. Yes, you'd think the Mrs Tim books would be perfect as reprints. Maybe if the Bloomsbury reprint series had continued. I'm reading MTFH now from Open Library but they don't have Mrs Tim Carries On so I'll still have that gap to fill. Just found your wonderful blog. Love the Mrs. Tim books, have read them all. Thank you, I'm glad you like it. The Mrs Tim books are a lot of fun, perfect comfort reading.